The oldest race series on the British Triathlon calendar has finally come to an end – a victim of HS2! The quirky swim, run, bike races are losing their venue due to HS2 construction work. The final race had a larger than usual number of competitors at the Harefield Outdoor Activity Centre. It should have been a non-wetsuit swim due to the water temperature, but wetsuits were allowed for the safety of novice racers. There was the usual clash of athletes as everyone converged on the first buoy. Natural selection prevailed – survival of the fittest! Fortunately the pack stretched out after this and swimming became less confrontational. The run is next – up a narrow lane to the main road. It is out and back, so you get a chance to see how you compare to other athletes. The final part of the run course is across a rutted field to prevent coming face to face with adrenalin filled cyclists going out on the bike section. The bike route was shortened due to construction work taking place on the usual route. It became a 10mile time trial, so no excuse not to go “all out”. Again, an almost out and back route. The finish is like a cycle time trial – you shout out your number as you go past the “timer” at the finish line. Following the finish, you go back to the outdoor pursuits centre for the famous finale. 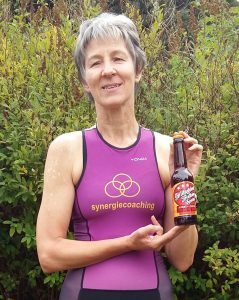 Not the presentation of prizes – beer and doughnuts for all finishers and supporters! This event will be sorely missed.